Nickeil Alexander-Walker in action against Duke in the 2019 NCAA Tournament. The Virginia Tech Hokies named a new coach on Sunday afternoon when Mike Young accepted the position. 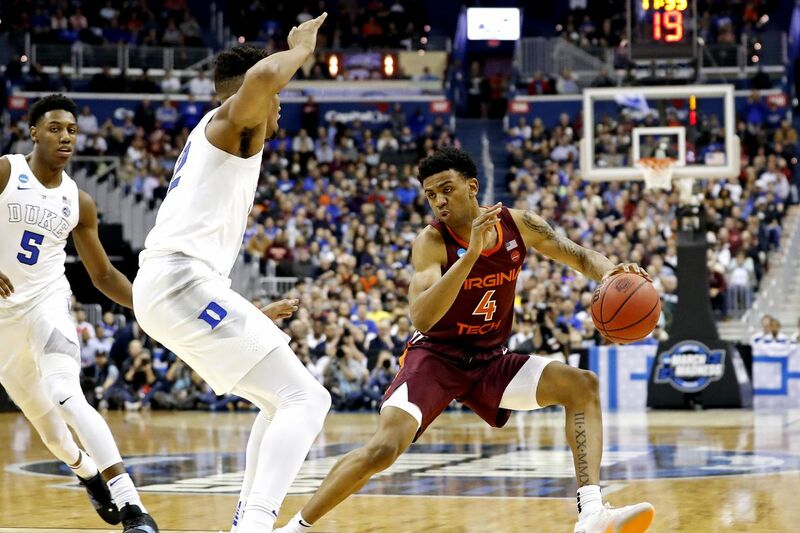 Shortly thereafter, the Hokies lost their leading scorer when sophomore Nickeil Alexander-Walker announced he had hired an agent and was entering the 2019 NBA Draft. Look, this was expected. Alexander-Walker flirted with the idea of turning pro after last season but wisely opted to return to Blacksburg. He certainly enhanced his stock this season with a strong sophomore campaign on arguably the greatest men’s basketball team ever at Virginia Tech. So, please, do not go and blame Young for this. The timing was more coincidental than anything. Perhaps athletic director Whit Babcock asked Alexander-Walker to meet his new coach before he declared and he obliged. Alexander-Walker joins Justin Robinson, Ahmed Hill and Ty Outlaw as players who will not return next season. Robinson, Hill and Outlaw all had their eligibility expire after outstanding careers for Virginia Tech. Sophomore guard Wabissa Bede entered the transfer portal last week. Bede looked overwhelmed at times this season when he received his big opportunity after Robinson’s injury. However, he did have a strong game against Duke in the South Region semifinals. Young could use Bede next season and will the new coach attempt to retain him? We saw with football that because a player enters the portal doesn’t necessarily mean he is gone. Chris Clarke also entered the transfer portal. Clarke, of course, missed his entire senior season due to a suspension. I wouldn’t expect him back with the Hokies even though he still has one year of eligibility remaining. Back to Alexander-Walker. He was one of the highest-rated recruits to ever sign with the Virginia Tech basketball program. His departure will sting but there is likely nothing anyone could have done to prevent his departure. From all of us here at Gobbler Country, good luck, Nickeil. Go become a lottery pick. Virginia Tech: Landers Nolley announces he’s staying with the Hokies The former four-star prospect has decided to stick with the Hokies. Wrapping Up the Spring “Game”: Virginia Tech Hokies End with a Controlled Scrimmage It wasn’t exactly a game, and we didn’t see any big questions settled. (Not that we thought that we would). But it was a fun Family Weekend Capper and the rain stayed away - mostly. We did learn some interesting things, though.